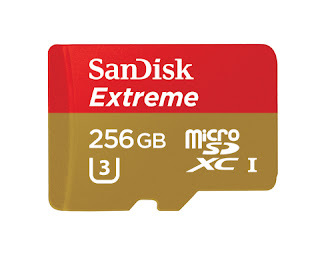 Western Digital® Corporation today introduced a new suite of 256 gigabyte (GB) microSD™ cards, which includes the new 256GB SanDisk Extreme® microSDXC™ UHS-I card – the fastest microSD card in its class. The new suite of cards also includes 256GB SanDisk Ultra® microSDXC UHS-I card, Premium Edition, the first 256GB card optimized for mainstream consumers. The new additions deliver leading speed and capacity in a fingernail-sized card, giving smartphone, drone and action camera users the performance and capacity they need to capture professional-grade videos and photos without worrying about running out of space on their device.